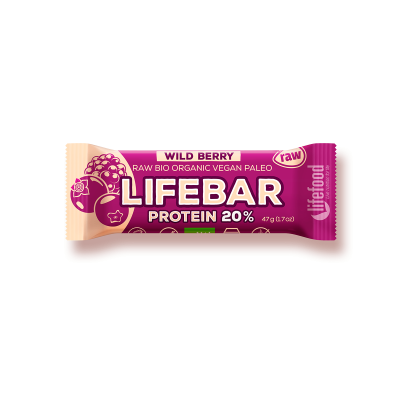 You will fall in love with this delicious RAW ORGANIC Lifebar Protein Wild Berry. 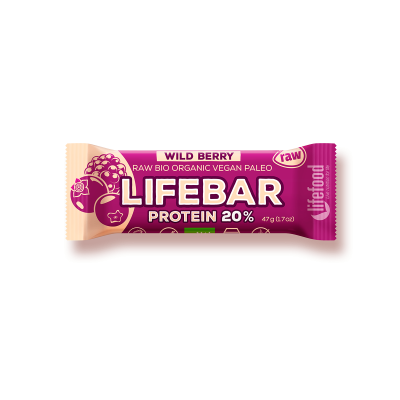 Juicy and refreshing, this bar tastes amazingly fruity thanks to raw black currant berries, raspberries and blueberries. The pumpkin seeds tie it all together and a hint of salt and essential orange oil enhance the overall flavour. Dates*, Rice Protein Powder* (16 %), Pumpkin Seeds*, Black Currant Powder* (4 %), Extra Virgin Olive Oil*, Blueberry Powder* (1 %), Raspberry Powder* (1 %), Salt, Essential Orange Oil*.